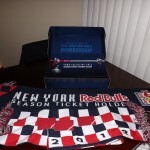 Finally the 2013 New York Red Bulls season ticket package is here! It’s that time of the year I use to let me know that warm weather is coming and great sports are on for me to watch. I have the NHL by night and MLS by weekend. 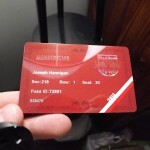 Matthew, Juston, and I renewed our season ticket package last fall. This is something I hope we can keep on doing throughout the years. I have owned my seats since the stadium was built, something you may never get the chance to say again. Good luck to the Red Bulls this year. 2012 MLS NY Red Bulls Schedule Can't wait for the season to start. Going to be very busy between the end of the hockey season and the start of MLS. Just waiting on the season ticket package to come.